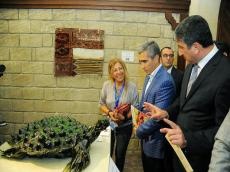 The 6th International 'From Waste to Art' exhibition kicked off at the State Historical-Ethnographic Reserve 'Gala'. The event is held with the support of the Heydar Aliyev Foundation, the “Tamiz Shahar” (Clean City) Open Joint Stock Company, the Historical-Ethnographic Reserve of Icherisher and “Q Gallery”. Primary objective of the exhibition, in which various samples of art made of domestic waste were presented, was to cultivate in population the necessity of keeping the environment clean, propagate careful approach of the planet’s environment, divert people from squandering, and make them refrain from throwing useless items into waste bins without thinking once more. The executive director of the Heydar Aliyev Foundation, Anar Alakbarov, the chairman of the “Tamiz Shahar” OJSC , Etibar Abbasov, the head of the Administration of the State Historical and Architectural Reserve "Icheri Sheher" Asker Alekperov, the cultural and art figures who attended the event, got acquainted with the exhibition. Works of 25 artists from 9 countries are presented at the exhibition. Along with Azerbaijan, the works of the U.S., Australian, the UK, Dutch, Spanish, Turkish, Czech, Cuban, Columbian and Japanese art masters were exhibited.